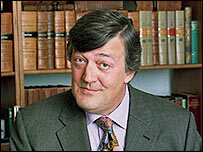 Actor Stephen Fry has broken his arm after falling over while filming in Brazil, the BBC has confirmed. The actor, 50, was filming for the Last Chance To See series, which focuses on the world's endangered species. A BBC spokesman said Fry was treated at a local hospital before being flown to the US for further treatment and then back to the UK. He would receive more treatment and hoped to be fully recovered to film later in the year, the spokesman added. "Unfortunately Stephen Fry has broken his right arm after slipping while filming in Brazil for a new BBC Two series, Last Chance To See," the spokesman said. He added: "Stephen will have further treatment next week but he hopes to be fully recovered to continue filming later in the year." Fry was on location in Tefe to film the release of an endangered Manatee into the wild. The series, made by BBC Wales, reprises the 1990 BBC Radio 4 series of the same name, presented by Hitchhiker's Guide to the Galaxy author Douglas Adams and zoologist Mark Carwardine. The pair also wrote an accompanying book. Carwardine is also hosting the TV series - this time with Fry as his co-host.